Gale Banks Engineering making a twin-turbo 5.7 Hemi? 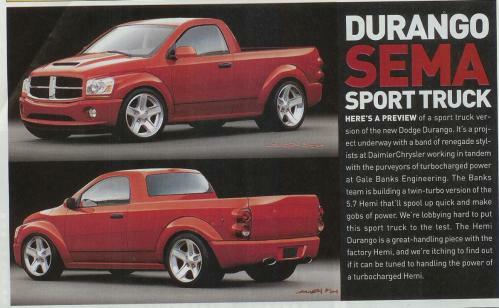 HERE'S A PREVIEW of a sport truck version of the new Dodge Durango. It's a project underway with a band of renegade stylists at DaimlerChrysler in tandem with purveyors of turbocharged power at Gale Banks Engineering. The Banks team is building a twin-turbo version of the 5.7 Hemi that'll spool up quick and make gobs of power. We're lobbying hard to put this sport truck to the test. The Hemi Durango is a great-handling piece with the factory Hemi, and we're itching to find out if it can be tuned to handling the power of a turbocharged Hemi.